With its rapid-fire gags, a penchant for (cartoon) violence, and boundary-pushing humor, The Simpsons are a good fit at the loud, in-your-face, we-love-to-blow-stuff-up Universal Studios parks. 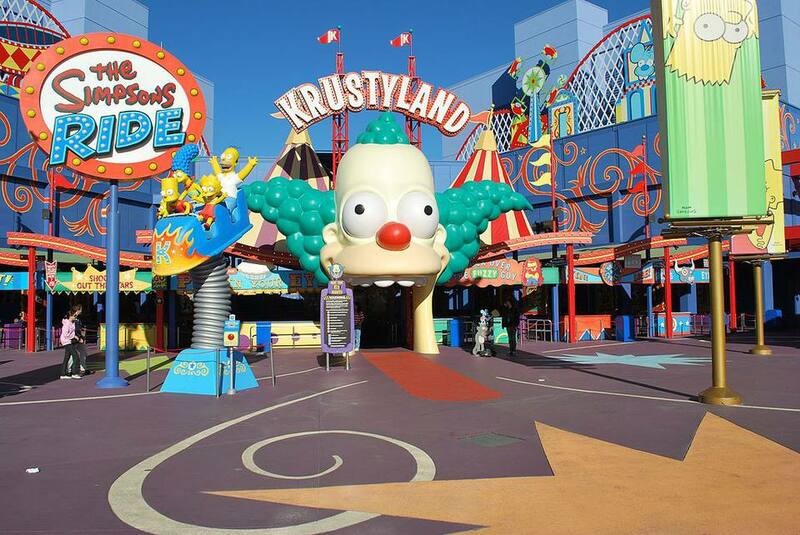 The Simpsons Ride gives guests the chance to accompany Bart, Homer, and the rest of the iconic clan as they experience Krustyland, a theme park that has been built on the cheap by Krusty the Clown. Of course, calamity ensues. And, since this is the Simpsons, hilarity ensues as well. Motion simulator thrills include (simulated) coaster drops and crashes. The Simpsons Ride is one of the 12 best rides at Universal Orlando. As a motion simulator, The Simpsons Ride at Universal Orlando syncs the action of its eight-passenger vehicles with wild animated footage. Although scenes include free-falling from nosebleed heights and mid-air collisions, the vehicles never actually move more than a few inches in any direction. If you can handle Star Tours at the Disney parks, you'll be able to handle The Simpsons. If you want to see what the concept of a motion simulator is about with a more toned-down attraction, try Universal's Despicable Me Minion Mayhem ride first. The attraction is housed inside a garish Krustyland building, with retro amusement park lights, eye-popping colors, and a giant head of Krusty the Clown. Guests enter the ride by walking along Krusty's "red carpet" tongue and into his mouth. The signature Simpsons humor is everywhere. The front of the attraction is made to resemble an amusement park midway with carnival games such as Ring Toss. "SMALL RINGS, GIANT BOTTLES-IT'S IMPOSSIBLE!" screams a sign on the booth. Throughout the queue (and lines for The Simpsons Ride can get quite long), there are giant video screens playing a 30-minute loop that includes new Krustyland footage interspersed with excerpts from park-centric Simpsons show footage. As guests shuffle through the rat maze, there are plenty of chuckles to be had. For example, one scene depicts dolls from around the world singing, a la Disney's "It's a Small World," the heartwarming refrains of "A Duff for you; A Duff for me..." from the "Selma's Choice" episode. Disney, SeaWorld, and other theme parks get tweaked throughout the queue and on the ride itself. The Pirates of the Caribbean would shiver their timbers if they caught the signs for Captain Dinosaur's Pirate Rip-Off. At both Universal parks, The Simpsons Ride is presented in the same buildings that used to house the Back to the Future attractions. As with that groundbreaking motion simulator ride, guests make their way through labyrinthine corridors and up to one of the multiple levels on either side of the building. Before boarding, they are held in a pre-show area filled with laugh-out-loud Simpsons displays that include Apu and Groundskeeper Willy. A hilarious video sets the stage as the guests are chosen to join the Simpsons family for the debut ride aboard Krusty's Thrilltacular, Upsy-Downsy, Teen-Operated Roller Coaster. However, a vengeful Sideshow Bob (the voice of Kelsey Grammer) is shown lurking in the shadows to sabotage the new park. Groups of eight passengers are shuttled to individual ride rooms where they watch a (literally) gut-busting, pre-ride safety video featuring Itchy and Scratchy. Instead of Back to the Future's DeLorean time machines, guests now board an oversized roller coaster car. At the start of the ride, the cars move ten feet up and join a phalanx of other vehicles in front of an enveloping, 80-foot Omnimax domed screen. Unlike Back to the Future's filmed footage, which used miniature sets and other old-school Hollywood trickery to create its time-shifting environments, The Simpsons Ride uses computer-generated imagery. This has its pluses and minuses. On the positive side, the footage looks sleek. (Although compared to the ultra-crisp, bright, high-definition media of newer attractions such as Despicable Me Minion Mayhem, the imagery looks a bit grainy and dark.) The motion simulator sensations, as the vehicles move in sync with the action on the screen, are very convincing. But, there's something disconcerting about seeing our old two-dimensional TV pals rendered in CGI. The crude animation is part of the Simpsons oeuvre. It sounds like the Simpsons (the original cast provides all of the voices), but it doesn't quite look like the Simpsons or have their usual fluidity. That detracts a bit from the ride experience. Still, in true Simpsons form, there are some wildly funny lines. In the face of impending doom, for example, Homer reassures his family that "theme parks wouldn't kill you as long as there's a dime left in your pocket." Except for the CGI misstep, The Simpsons Ride is in tune with creator Matt Groening's distinctive (read: warped) Simpsons sensibility. Fans of the show—and there are legions of them—will love taking a ride with them. And more casual fans will likely adore the attraction as well. In any event, everyone would agree that the attraction is considerably more fun than Captain Dinosaur's Pirate Rip-Off. What Ticket Do I Need to Ride Universal's Hogwarts Express?